Our most interactive learning mode provides maximum face-to-face interaction. Course delivered by a live instructor - you attend from your home or office. Bring our world-class instructors on-site to train your whole team. This 3-day introductory course will teach you ITIL basics and prepare you to pass the certification exam - guaranteed. This interactive, one-day simulation is a high-impact, energetic way to accelerate understanding and acceptance of ITSM and ITIL best practice in your organization. This hands-on, collaborative class will teach you Agile & Scrum basics - and everything you need to know to pass the Certified ScrumMaster exam. Looking to train your whole team? 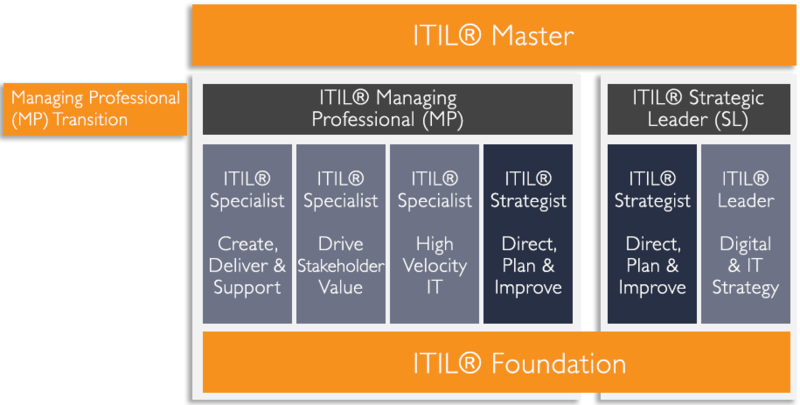 What is ITIL 4 Foundation? Released in February of 2019, ITIL 4 Foundation is designed as an introduction to ITIL 4, enabling you to look at IT service management through a BRAND NEW end-to-end operating model for the creation, delivery and continual improvement of tech-enabled products and services. What is different about ITIL 4 vs. ITIL v3? While ITIL 4 retains many of the core elements of ITIL v3, and much of the existing guidance will be recognizable in parts of ITIL 4, there are no direct like-for-like modules between the two certification schemes. Think of ITIL 4 as an update or enhancement of ITIL v3 – not a replacement. I have ITIL v3 (2007 or 2011) Foundation Certification. Should I take ITIL 4 Foundation? If you’re ITIL v3 certified, we recommended approach you take ITIL 4 Foundation in order to be able to transition to the new scheme. There’s a large amount of new material in ITIL 4 Foundation that will prepare you to take on emerging challenges and trends in the industry. You also have the option of obtaining 17 credits from the ITIL v3 scheme, which would make you eligible to take the ITIL Managing Professional transition module to migrate to ITIL 4 scheme. ITIL v3 is as relevant as ever and remains in demand around the globe. It continues to support organizations and individuals to gain optimal value from IT and digital services. ITIL 4 retains many of the core elements of the good IT service management that continues to give value to millions of people and businesses around the world. All certifications for ITIL remain valid and will continue to be recognized as valuable certifications globally. All credits gained can help you continue your ITIL journey in the new certification scheme. I'm ITIL v3 certified - is there an ITIL 4 Foundation Transition Module? Due to the structure of ITIL 4 Foundation, there will not be a transition module at the Foundation level. However, if you’re ITIL Expert certified, you will have the option to bridge to the new ITIL 4 Managing Professional certification in late 2019 (more details on that to come). How many days is the ITIL 4 Foundation class? The ITIL 4 Foundation class is 2 days. You’ll take the exam at the end of the second day. How many PDUs will I earn for this class? If you’re PMP certified, you’ll receive 16 PDUs for completing the class. All course materials – a course workbook, exercises, case study, practice questions, and the certification exam – are included. What's the format of the exam? The ITIL 4 Foundation Exam is 40 multiple choice questions. It’s a closed book exam, and a passing score is 26/40, or 65%. You have one hour to finish. We guarantee that all of our students will pass the exam – over 98% of our students pass on the first attempt. However, should you need to retake the exam, we will assist you in preparation and set up the retake at no additional cost. You can always attend the course again at no cost, although in most cases this isn’t necessary. What is the difference of Utility and Warranty? Who are the customers and what do they want? No temporary workers or subcontractors here. Our trainers are working consultants who implement best practice processes and tools when they're not in the classroom. You might say we practice what we preach. It's a great system, when you think about it - we're better consultants because we know these concepts inside and out, and we're better trainers because we get to put the theory into practice in the real world. 2 Nov 2018What is the ITIL 4 Service Value Chain?